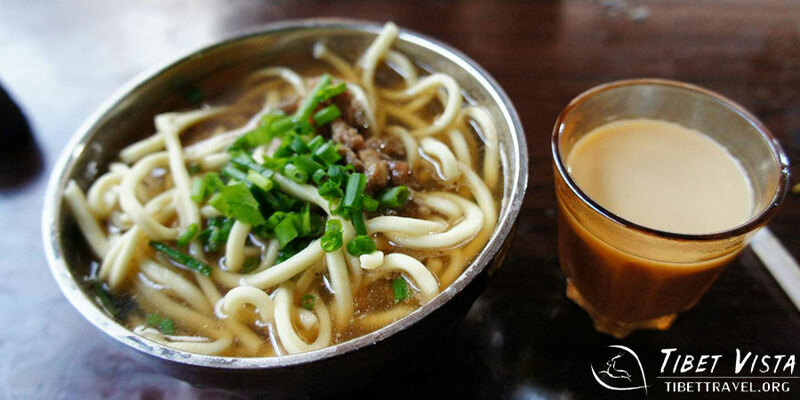 For foodies, you may sample some typical Tibetan dishes like Thenthuk, popular Tibetan noodles made of yak stock and vegetables, fried potatoes, dried yak meat, sweet Tibetan yogurt, Tibetan bean jelly in chili sauce, and Tibetan momo, kind of unique dumpling in Tibet, etc. The sweet tea house is boisterous with appetizing Tibetan snacks. Undoubtedly, Lhasa is the place where you can taste a variety of food, wholesome Chinese set meal, Nepali yak curry, finger-licking Indian Tandoori Chicken and standard western continental food. 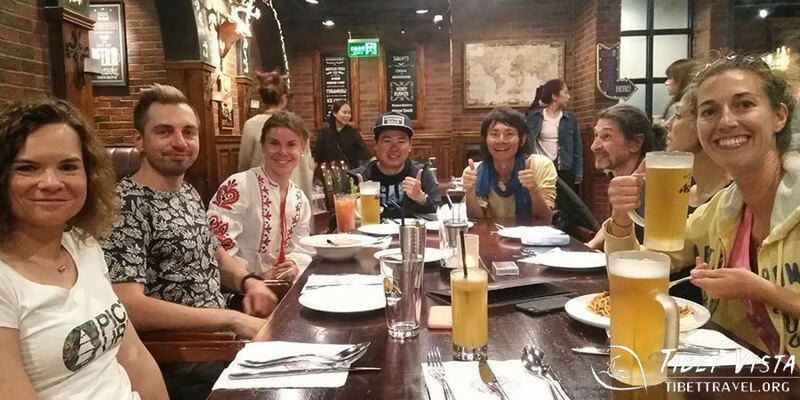 Some even prefer to try Tibetan hotpot and yummy Tibetan pigs and enjoy the refreshing flavor of well-known Lhasa beer. Of course, much more to explore in numerous restaurants across Lhasa. 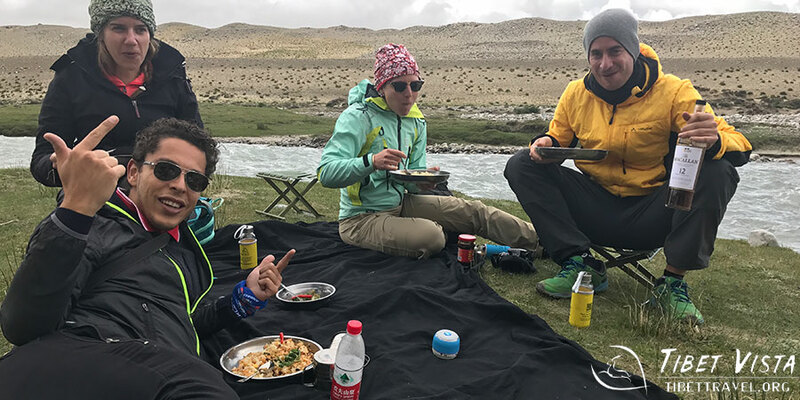 And if you travel to EBC or western Tibet, the simple rule is that the more remote regions you travel, the food would become much simpler and more basic. However, we would also manage to take you to the restaurant with the best bargain and wholesome dishes. With time permitting or for some private Tibet tours, you will be lucky to visit the houses of local Tibetans and be their guest. The welcoming house owners will greet you with warm sweet tea and place many traditional Tibetan snacks on the table for you. You will get a rare chance to taste home-made Tibetan pastry, milk dreg cake, dried yak, sheep ribs, Tibetan yogurt with raisin sprinkled over it , Tsampa, cheese yogurt and milk curd, etc. Meanwhile, you can learn more about Tibetan customs and the architecture of Tibetan houses. The nightlife in Lhasa is anything but dull. You may enjoy the singing and dancing performance in the famous bars like Makye Ame with your Tibetan guide and travel mates. And the Lhasa beer takes the center role on such occasion. Of course, you may also order western dishes like spaghetti, beef steak…and Tibetan momo and other Chinese dishes as well. What to Expect during Your Trekking Tour? Well, before your trek, the logistic such as food supply will be properly arranged by your Tibetan guide. Since most of the time you will be traveling in the unpopulated regions, either a chef or our Tibetan guide will prepare the food for you. If you want to share with others your specialty, you are more than welcome to join the cooking. 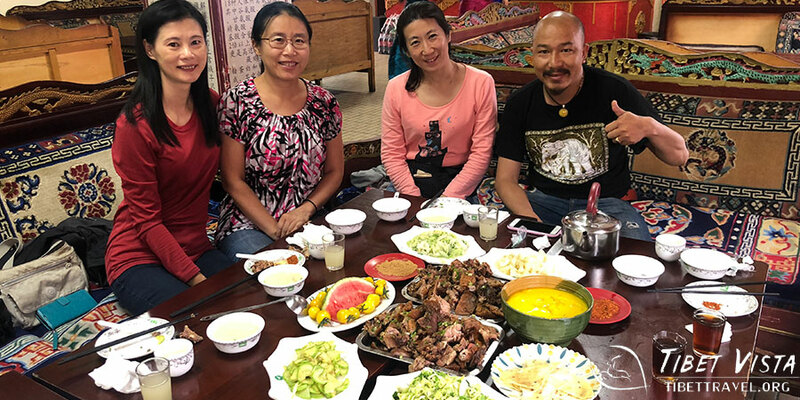 Deeply impressed by the savory Tibetan food and want to share the same flavor with your family back home? No problem! 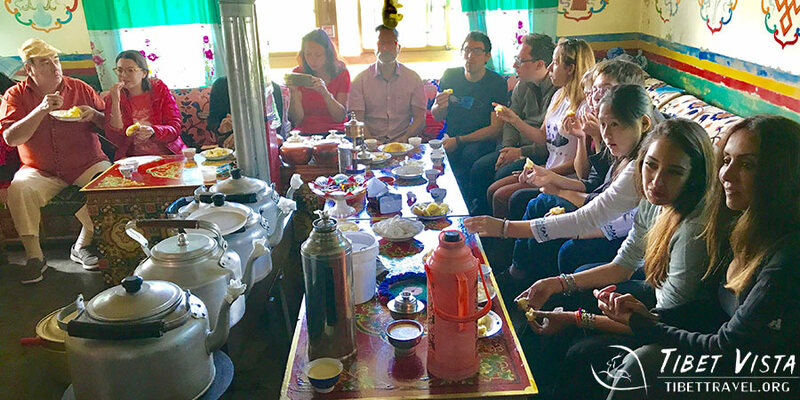 With proper arrangement, you can acquire new cooking skills with the help of our Tibetan guides. Follow our guide to sample fine ingredient in old farm produce market like Tromsikhang, Lhasa and pick up new Tibetan cooking techniques, sounds fantastic? 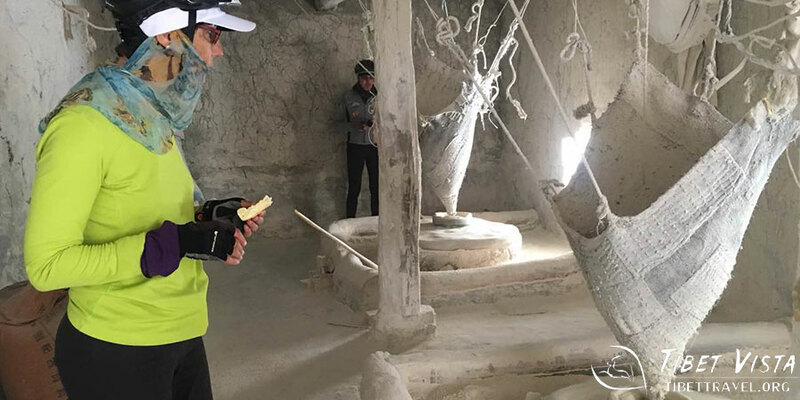 Apart from eating Tibetan food and visiting farm produce market in Lhasa, if you join our EBC tour, in summer while you pass Shigatse, you even will have an opportunities to watch the making of Tsampa, Tibetan staple food, in traditional Tsampa mill.